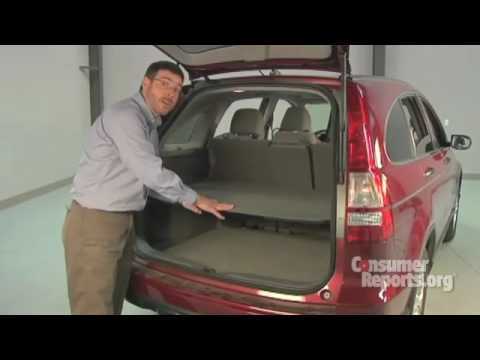 Few vehicles do as many things as well as the 2009 Honda CR-V. As practical as a backpack, this benchmark crossover is an easy, stylish one-size-fits-most car choice. The 2009 Honda CR-V, the family car. I drive a 2009 Honda CR-V and I like the car a lot. It has given me a reliable car that can take me long distance and provide me the insurance I need to make sure it will not fall apart throughout a trip. The car is a little on the small side when it comes to space. When I drive my head is basically at the top of the car and I get claustrophobic which makes me a little uncomfortable. It is not awful but it would be nice if it were to be bigger in size that way. The rest of the car in terms of storage is great. There is a lot of space for my baseball things and other people to ride in. It is very reliable, I have never had a problem with anything failing. The car is great for the average middle class family. It can fit a family comfortably and make sure everyone is safe. My favorite feature is the sunroof. I can open it if I want the sun to peak through the car and even open it all the way if I want some extra air flow. The windows in the back however do not open all the way, which I would like to see change, but it is not a deal breaker. It is very comfortable with the leather seating, although I got some water on it so it ruined the leather. If it were to come in a fabric material that would be my ideal car coverage. I get a great feel for the car too. I know exactly where it is and how close I can get to things. Honda CR-V for a family of three. This car has lasted me a very long time. I have two children and it fits two car seats in the back nicely. The trunk is a nice size for strollers and a few other things in there at the same time. I hadn't had too many problems with the maintenance of the car until recent but I have well over 100, 000 miles on it. There were a couple recalls on the car which Honda notified me on and fixed for free so it was no problem. I felt very safe in the car. It handles snowy roads well, as well as rain. The seats are comfortable and I love the armrests in the front seats. The radio and 5 disc CD player are also good. And has a nice sunroof. Perfect sized vehicle with great reliability. I love my Honda CR-V! Its large enough for me to load bigger items and transport them with ease. Even though its a larger vehicle, it gets great gas mileage. It's also a super comfortable and smooth drive. I feel very safe in this car because of the size and the reliability. I think this car would be great for parents or people without kids. It has a rear view camera which has proven to be extremely helpful. With the help of that I have avoided having a possible collision. I know that i'll have this car for a very long time and when it's time for a new one, I can easily see myself purchasing another car of this make and model. Honda CRV 2.4 2009 - CRV PALING FUN TO DRIVE!